Oil painting on wood panel. 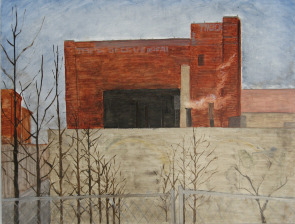 Artist's caption: "This is what remains of Ortlieb’s Brewery seen from across the park." Courtesy of Jennifer Baker. Images may only be used with the permission of the artist.